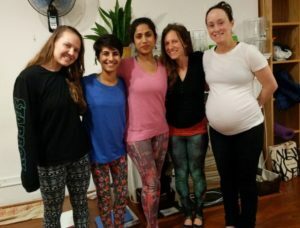 Prenatal yoga class is often misunderstood to be simply be a modified asana class, but actually there is great potential for exploring the deeper aspects of yoga. 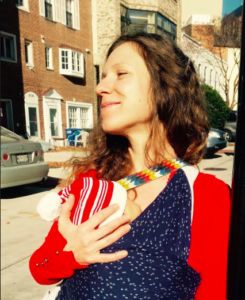 Mamas are invited to slow down and pay attention to their bodies, breath, mind, and emotions. Prenatal classes often focus on strength without being physically intense. They provide the opportunity to really practice how we hold our awareness. Students’ bodies during pregnancy are vulnerable to being destabilized. So in class, we focus exquisite attention on both stability and proper alignment. Finally, a prenatal class can be like a little refuge from the outside world. Vital connections are made as mamas walk a similar path together. Since the focus is on yoga during pregnancy, we look at certain aspects of the physical body with quite a bit of detail (especially pelvic anatomy and posture). We also pay attention to how the breath and breathing practices shift during this time. Meditation, as a way of conditioning the attention, is incorporated into the training as well. The final component is learning four sequences that can be modified to meet the needs of pregnant students. This is all done within the context of celebrating the changes that accompany a new life unfolding within the pregnant body. You will learn more about pregnancy and birth. To gain a deep understanding of all of the above, we spend our time between participating in practice, experiential anatomy, lecture, group discussion, and teaching. 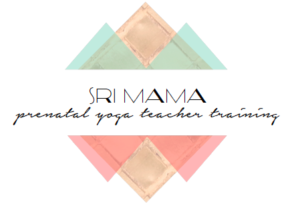 By the end, you will be prepared to facilitate a relaxing, healthful experience for pregnant yoga students. Providing a safe and enjoyable practice during their journey.